A lot of the calls we get as trainers involve dogs that have problems on leash. These problems might show up in a whole lot of different ways. One dog might be so fearful that he can’t walk twenty feet from his house without shutting down completely and trying to run home. Another dog might bark ferociously at any dog within a ten block radius. 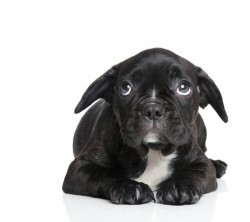 Any decent trainer will tell you that treating these problems will involve some form of classical counterconditioning (changing the dog’s emotional response to a specific trigger by pairing it with something the dog really likes), along with desensitization (very gradually increasing the intensity of the trigger at a pace at which the dog is comfortable). On paper this seems simple, and in some ways, it is. However, the actual process of taking a dog through these stages can present some really difficult challenges and some serious roadblocks for the average dog owner. If you’re a “dog person”, like half the trainers I know, then you’ve got an endless supply of colleagues, friends, and family that are willing to meet you in various locations and act as guinea pigs while you carry out your training plan. For most people though, finding people to help you, let alone people with dogs, can be next to impossible. This is where we need to get creative. We need to find ways to work with these triggers as we find them in everyday life. Call me lazy…or call me efficient (I prefer the latter), but over the years I’ve become a stealth-mode dog trainer. Show me a problem dog and I’ll find a place to train him that’s practical! Let’s go over some simple but really effective locations for scaredy dogs and angry dogs too. My dog doesn’t like kids. Grab your treats, your clicker, and make sure your dog is safely outfitted in all the right gear. If he wears a muzzle don’t forget to bring that along as well, and double check that he’s safely secured using two points of attachment (two places where the leash can attach on his harness) if there’s any risk that he might lunge or run away. Find a local school and set up shop down the road when school is just about to start or is just getting out. Pick a spot that is far enough away that the kids aren’t in any risk and also may not even notice your dog, such as down a driveway or an alley or across the street behind a car. Also make sure that you’ve found a spot where there’s a steady enough stream of kid-traffic that you can get some serious clicking and treating done! Make sure your dog isn’t showing ANY signs of stress and start working! Click and treat every time he looks at those little screaming munchkins. Because the kids are all heading home chances are they’re on the sidewalk which allows you to stay plenty far away and keep the session to a reasonable short time period. My dog doesn’t like men. Again, come prepared with plenty of treats and get creative. I live in a city with a lot of factories. That means that there are lots of workers coming and going down the sidewalk during shift change! My clients are pretty amazing at finding a spot that allows for lots of distance, where they can quickly click and treat as all those men in scary hard hats, coats, and big boots stomp past. Counterconditioning gold! Other places that might work are business districts before and after work, or baseball fields before and after a game. My dog doesn’t like other dogs. Guess where there are lots of dogs hanging out? Pet Stores! The parking lot of a busy pet store is counterconditioning heaven. Not only do you get the benefit of dogs moving in a predictable direction, but you also get the advantage of being able to move behind a car to block your dog’s visual if he should become a little stressed. In general I prefer locations where the scary thing is walking by as opposed to just hanging around. This allows me to make the clear distinction for my dog that good things happen when the trigger appears and they stop happening once the trigger has passed. In time, the hope is that your dog will look forward to seeing these scary things approaching! It takes lots of time and even more finesse, but it’s definitely possible.